Sitting, feeling slightly hassled in the Castle office on Friday, I was trying to meet a number of deadlines and as usual could not seem to fit everything into a day. I asked whether Paul Mac and Louise, my PA, would help me by kindly going to find some of the old toys and the pram stored on the top floor of the Castle as I needed them to be photographed. Both of them find the top rooms of the Castle quite spooky, thus Hannah G from Press and PR, who overheard, said she would go up with them for moral support. They also took the puppies, Stella and Freya, for reassurance. It would be fun. Stella and Freya on alert! 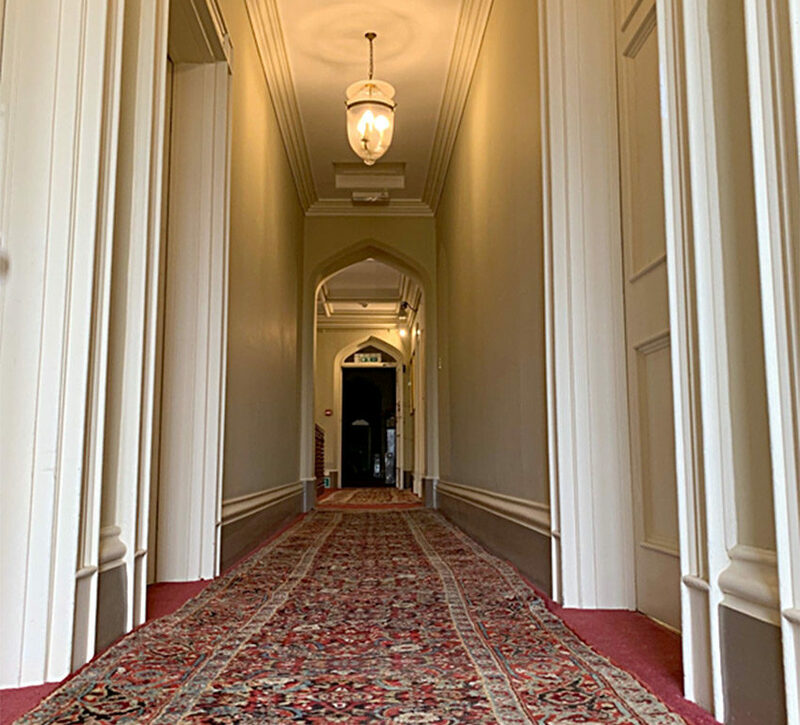 Blithely, Hannah led the way upstairs, passing by the bottom of the Charles Barry Tower and along the long, red carpeted corridor. Unbeknownst to any of them, Josh the Joiner was also upstairs on that particular floor. They met and explained what they were doing. Standing some four feet behind Hannah, Josh delicately touched the top of Hannah’s head with an extended tape measure. She screamed and screamed – (she could have been auditioning for a part in a “Mummy” film) – and leapt around thinking someone (or something) had touched her head. We heard the screams downstairs and John G the Castle Manager immediately went up to investigate and to help – after his own fashion. 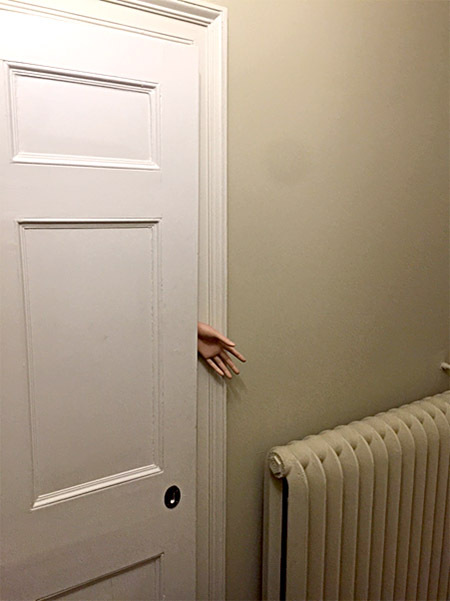 Nervously, the party proceeded around the next corner where, unfortunately, Gladys the mannequin’s hand was jammed in the door of the cupboard in which she lives, and it was slightly ajar. Louise at this point leapt into Hannah’s arms, who bumped into Paul, who also jumped and yelled. John G arrived on the scene and suggested to Paul that the pram might be in a room on the right. When Paul had plucked up the courage to go in John shut the door on him. 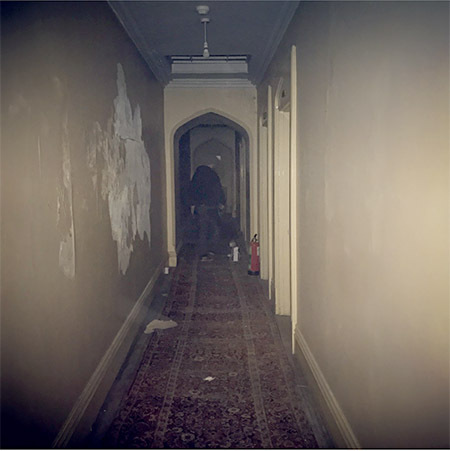 Paul said “please let me out” knocking frantically on the door, and pulling at it to try to open it, with John claiming the lights had gone out all over the Castle. Actually Paul needed only to have turned the handle to escape. The ever larger party now continued along a further corridor which was now just dusty floorboards. 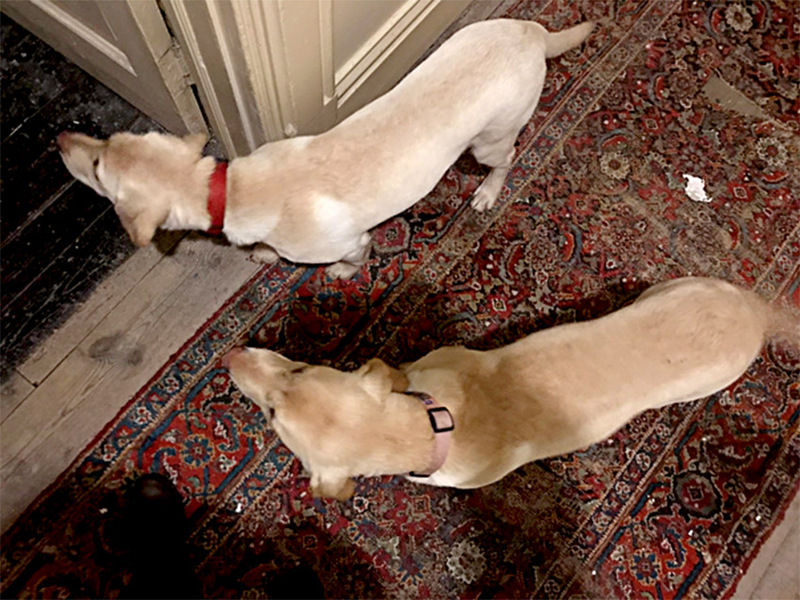 Louise and Paul tried to push the puppies into each room ahead of them on the basis that the dogs would sense any ghost first (which reminded me of the Scooby-Doo cartoon) but they felt there we some rooms they could not look into at all. The chances of finding said pram and toys were diminishing rapidly. Louise looked cautiously round into a room, caught sight of her own face reflected in a mirror, leapt back and screamed. By now Josh, thoroughly enjoying himself, had crept ahead and noiselessly opened a white panelled interconnecting door at the back of a particularly dark bedroom. Puppies or no puppies, Hannah and Louise exited at a run only to come face to face with an old wooden rocking chair which John G had managed to get going as if some ghost had just stood up from it. Paul by now would not enter any room and was desperate to run back along the corridors but could not face passing Gladys’s hand. Josh then insisted on showing the team a ‘head’ he had found – in fact he just meant some antlers but John decided that this was the point that he needed to return to his office immediately and contemplate his piles of notes and paper in endless brown paper folders and endeavour to add to them. He refused to let Paul Mac go with him. Eventually, triumphantly, Louise and Paul Mac found the toys that I had wanted to reference and Hannah found the big old pram. They carefully closed all the shutters, turned off any lights and retreated. Nanny: lovely to look at the Millsom pray again.Full marks for storage. LOL LOL!!! Great sense of humor! Many tales to be told in THAT attic!! I was sitting in a doctor’s waiting room while reading the wonderful blog and was actually laughing out loud. I got some strange looks, so good thing it was not a psychiatrist office. Oh my goodness, I laughed so hard reading your blog post! I absolutely adore exploring in homes with a history and would probably spend hours and hours at it if the opportunity ever presented itself!. Loved my time at Highclere this past June, and am looking forward to seeing it all again… It was chucking it down when I was there last, so didn’t get to see the gardens… When I return in April.. This American girl can’t get enough of Highclere or the gorgeous English countryside! Cheers! I would absolutely love to see the ENTIRE place! Such History!! Just Wow, hoping to see it sometime in the near future! added a chill to my thrill. Loved this story! Thank you! Love this story! I have been on the edge of my seat the whole time reading it! This was written so beautifully! Thank you for a good laugh this morning! I visited you in November and had a lovely time- I can ‘feel’ the house between your lines and only wish I could have seen those upper corridors!!! Thank you again for your wonderful Blog! It was funny, loved reading it! This story just made our Sunday afternoon! My husband and I laughed and laughed at Josh’s antics and the ladies’ reactions! Now you all know how to have fun in a castle! Keep up the great stories. We love to be a part of your lives since most of us are never lucky enough to experience the joy you have of living on such marvelous grounds. This is a bit of departure from your current posting (delightful, as always) but are you aware of a major exhibition in Los Angeles on King Tut. that is, unfortunately, closing soon? I just learned about it. The Egyptian curator/archaeologist described some of the items, and stated yesterday on an American television program (CBS Sunday Morning, if you can find that) that this will be the last time these artifacts will leave Egypt–a new museum-home for them is under construction in Giza. Of course, Howard Carter was briefly mentioned, but not, unfortunately, the Earl who financed his expedition. Trying to read this to my husband, and laughing so hard I can’t get the words out – he thinks I’ve lost my mind! I’m glad you are enjoying it – laughter is so good for us! Great story! I hope all have recovered from their experience. The dogs were probably getting annoyed with the wacky humans at some point in the adventure. Have a great week, one and all at the Castle… Cheers from Summerville, SC. It may seem quite early to be asking this question, but do you know if there will be another “Downton Abbey Christmas Ball” tour this year? Last year Friendly Planet had a tour package — but by the time I learned about it, it was too late for me to go. I sounds like a dream to be able to visit Highclere at Christmas time. Christmas is quite far off in our thinking, but there will be some very special events in December so keep checking on our website. All brave souls to even go on their spooky adventure! You have loyal staff & friends, thank goodness for the courageous pups too. The third floor of the castle is exactly how I’ve envisioned it to be……scary yet wonderful, filled with memories of times past! By the way, my grandmothers third floor was the same way. As a child we would sneak up there giddy with excitement, ready for the ghosts to pop out and get us…..great memories! Laughed out loud, thanks for the great stories! Makes me wish I worked there. how thrilling! It’s amazing how quickly fear is shared amongst a group of people; even the most sceptical can be drawn in. Hopefully if you do have any ghosts they are friendly, family ghosts, watching over you. I did enjoy reading this blog. The rocking chair sounds like the scene for the Woman in Black Film, I wouldn’t recommend that they watch it. Josh was certainly enjoying himself wasn’t he? I wonder if the puppies rolled their eyes at the humans? I doubt you will ever get them back up there again. I do love those old large prams. Maybe the spirits were doing some late night reading! So funny and. sooooo spooky. I would love to be in on the pranks, but I’m sure I could never walk up those steps alone. No, most of the staff do tend to go in twos and threes! I woke up early. Checked email and started reading your post…and the bed began to shake because of my laughter. My husband wanted to know what was up. We both laughed very lomg and hard and woke up our daughter. You are a very funny batch of castle dwellers. I am quite delighted to be given such a funny start to my day. Thank you. Thank you – we do share a lot of laughter alongside the hard work. The story of Josh’s scaring the “hunting party” had me in tears as I was laughing so hard until you mentioned the light being on after you had checked. The History Channel, a cable station, once offered a series called “Haunted History.” I believe (since this is going on 20 years ago) that one of the places the show visited was a former military base which was now a museum. The episode showed one of the caretakers turning off a lamp on a large table and apologizing that he was required to do that, but “they” could turn it on again. Despite his turning the lamp off each night, the lamp would be on again in the morning. My husband pointed me to the Daily Mail story two weeks ago that had the “teaser” trailer for the movie, which I watched with great delight. We went to see a movie over the weekend and I was nudging his arm as a new trailer started with the ticking of a clock. I am eagerly awaiting Sept. 20, which is the date of the U.S. release. We are all eagerly awaiting the movie – in the UK we get it a whole week early on 13th September! I’d love to explore all the different rooms no longer used! Fun read!! There are plenty of them – most used for storage these days. For me, who has great Clairvoyant, Mystic strength and Power, I can attest that the people who once lived and died in the Castle are still there. They never leave because it was the only home that they ever had, and felt loved, and welcomed in there own huge play house. They also watch over the Castle, and sometimes you watch and or hear your dogs, all of a sudden very alert, and dart off in a direction that you were not taking them in! Please, enjoy all of your family who you cannot see and they will ALWAYS, protect you and your love ones. Enjoy your invisible family reunions, they love your cooking. Well, you seem to have a pack of enterprisingly susceptible folks there with you. 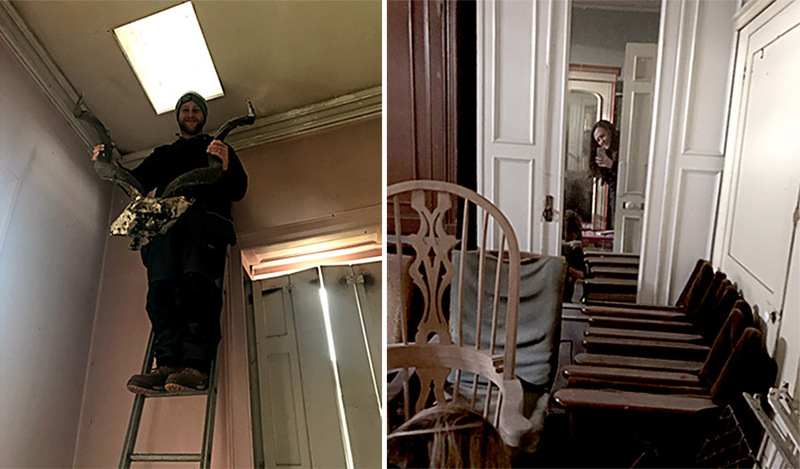 Having spent my whole life in very old houses, nothing about them ever really frightens me these days, except for a mysterious, dripping damp spot on the ceiling, which indicates that an antiquated pipe somewhere upstairs has burst in the night. For truly atmospheric (it’s very well written) and scary? Read Sarah Water’s novel “The Little Stranger” (See attached link for the trailer). It’s about the remnants (widowed mother, shell-shocked son, and strange daughter) of a country gentry family who are still rattling around, post WW II, in an enormous, rapidly decaying, family mansion. The novel’s quite Turn-of-the-Screw-ish in that you never know if there really are ghosts or if the entire family (and the young doctor who becomes involved with them) is simply succumbing to some sort of contagious hysteria. It’s VERY good. The movie, which I’d been eagerly waiting for, came out this past Fall. It, also, is very good (although I don’t think it’s made of a dent in America, where we tend to prefer our scary movies to be gory bloodbaths, and our monster/ghosts to be 7′ tall chainsaw wielding maniacs, rather than the unsettling presence of a dead 7 year old girl who may or may not actually be a ghost). In any case, read and/or watch it for some good spooks. If nothing else, it offers the sight of Charlotte Rampling (she plays the oddly distant mother), which is still a treat…..just looking at her. 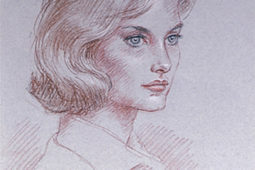 Watching her in the movie a couple of months ago, I recalled W.B. Yeats’s comment about the elderly Maude Gonne (quite the famous beauty in her youth); he referred to her as “The most beautiful ruin in Ireland”. We are so lucky to have a wonderful team of people here at Highclere. Some more superstitious than others! Your blog was the perfect start to my day. It’s dark and raining here in Chicago today so the weather lent a bit of spooky atmosphere. Terrific read – as usual. That is the kind of thing that gives me the creeps, too!! Even though I don’t believe in ghosts. . .exactly! Such a brilliant idea to take the pups! I had an experience not in an attic but on the street in broad daylight in the shopping area of Washington, D.C. where some of us were shopping as college girls many years ago, and a group of the boys from college saw us, but we didn’t see them. One came up behind me and attempted to take my purse from off my shoulder. I swung around and nearly clobbered “whoever it was”! He ducked and I missed. We all had a good laugh. But the Adrenalin was flowing, I’ll tell you!! It was all automatic!! I wonder how many ghosts I would clobber if I ran into them!! This was a brilliant piece!! You are very good at building suspense . . . and with some humor! I loved the way each of your employees kept frightening the others!! You ought to write an “Agatha Christie” type thriller. You have tremendous subject matter right in your own home!! They did wind each other up…. Hannah keeps giving screaming demonstrations. That was a fun story! I’m now curious to know who would have used the third floor rooms and how often they were used back in the day. I image guests may have felt a little scared too up there if they were the only ones, though I guess there would have been many staff members toiling about as well. It also makes me wonder how guests would have been assigned to rooms/floors. My guess is the higher your rank in society, the closer you were to the family rooms. Anyway, the treasure at the end was found and that pram is beautiful, and a little spooky too! There were and are some beautiful family bedrooms after two side of the building you go through a green baize door into the staff corridors. Thank you Lady Carnarvan for starting my Monday with a good laugh. If laughter is the best medicine, I am going to be quite well for a long night time. I so enjoy your blogs. I love reading all of your blogs. Love the photos you post too. My dream is to visit Highclere Castle one day hopefully sooner than later as I am in my late 60’s. This particular blog had me laughing this dreary morning. Thank you. Have a fabulous day !!!! I was crying with laughter !! Thank you so much for bringing a chuckle to my Monday morning. I only signed in to your blog a few days ago and love it. I visited there two years ago—hightlight of my trip. I am returning in May with my cousin and we are visiting two times. We are very excited. We are coming from Arkansas in the US. I am so happy you have opened it to the public. I appreciate all the work and love you have put into this beautiful place. Am happy I have your blog to keep up prior to my visit. I love it, great reading. Reminded me of when I was working as a visitor & used to visit some flats. A large mirror just inside the main front door always made me jump, seeing full height of myself, thinking it was someone waiting for me! Used to kid myself I wasn’t afraid ha ha. The imagination is a wonderful thing, especially when heightened by the imaginations of those around you. Well done- love the hand stuck in the door! Love it! Sounds like something we would pull here when we are ghost hunting…..
All older homes have memories. I was at Highclear several years ago. Beautiful but had feelings of energy in some of the rooms. Don,t laugh. I really loved it. I hope it is good energy but the house has seen centuries..
Dear Lady Carnarvon —Kudos to you on your weekly stories, always interesting and varied. I love Monday morning waking up to a new adventure everyone different and interesting. You just seem to cover every imaginable topic and they make for a good read. Thank you for making my day. Best wishes to you for continued success. Ghee what an adventure! Glad you were able to finally find what you needed. Cannot wait until the next adventure, I bet it will be a ghostly presence pawfully . . .
Well done, loved your story. The hand in the door reminded me of an experience I had many years ago. I worked as a floral designer for a company in Toledo, Ohio. On a very hot summer day, I had finished my work and walked out to my car to drive home. When I walked around my car to open the door, I noticed a car parked close and when I looked more carefully, I saw what appeared to be a small child with it’s hands caught in the back seat window. It looked as if the child’s hands had been shut in the window as it was closed. I panicked. I ran back inside the place I had just exited to get help. I explained to them what I had seen and instructed them to call for help. I could not understand it when they acted so calm and laughed! It seems the car belonged to a prankster who worked in the office next door. The ‘child’ was a dummy he had placed there to get the exact reaction I had given them. They laughed and laughed. Me? Not so much. I guess I gave him the reaction he desired. I laugh about it now! I am counting the days until the opening of the movie! Are they finished filming in the Castle by now? I so enjoy reading your very well written blog. I will add this one to my ‘Highclere Castle’ file on my computer. The filming is finished – editing now! Such a treasure to be surrounded by co-workers who can enjoy each others’ company in this way. What a delightful story! I love exploring old homes and cannot imagine how enchanting (and spooky!) Highclere’s upper floors might be. Enjoyed Mother’s Day and meeting you at Highclere last spring and looking forward immensely to seeing you again in February at Amy’s conference in New Orleans, another location with an abundance of ghost stories! This will be my first visit to New Orleans and I am looking forward to it! You must really have a fun group around you! Thanks for sharing! I think you have to “get” Highclere.. I started reading at work and had to laugh! had to stop and will finish later…. Hilarious! What’s a castle without a ghost – or at least a lepraucan Love your shenanagans on a weary Friday. Oh thank you for this wonderful story. I love a good ghost chill! Perhaps you could add “Haunted Highclere” adventures to all the other great things you do with your beautiful home! What a tale of adventure! I was actually thinking how fun it would have been to be exploring those rooms with the group. With such a rich and varied history, your home must hold a certain spirited nature. I don’t find such places to be spooky, but rather, fascinating and oh so interesting. Quick question….were the videos of the door slamming and chair rocking, actual occurrences that the staff witnessed? Sending best wishes to you in the New Year! What an adventure! How much fun to take part in this venture! Makes me want to return and visualize the upper stairways. Thank you, Lady Carnarvon! Loved the story and your writing is such a delight. I laughed until tears flowed and the cat checked in with me. What a group of employees to go on a treasure hunt for you and also have fun, too. Thank goodness the dogs were there, too. You just made my day. Besides, having grown up a bit in really old(~1700s-for USA) houses in deep/dark swamps I was well-versed in who/whom I might meet. The Elder Relatives explained it all with great serious expressions. There were so many times I didn’t know if the person was alive/”had passed”. And, I loved the pram. I had inherited one for my elder son’s birth- completely impractical for my environment at that time. However, it worked so well in the house for him, toys, books, etc. that I used it for a long time. Thank you again for the laughter this morning and for bringing back sweet memories. 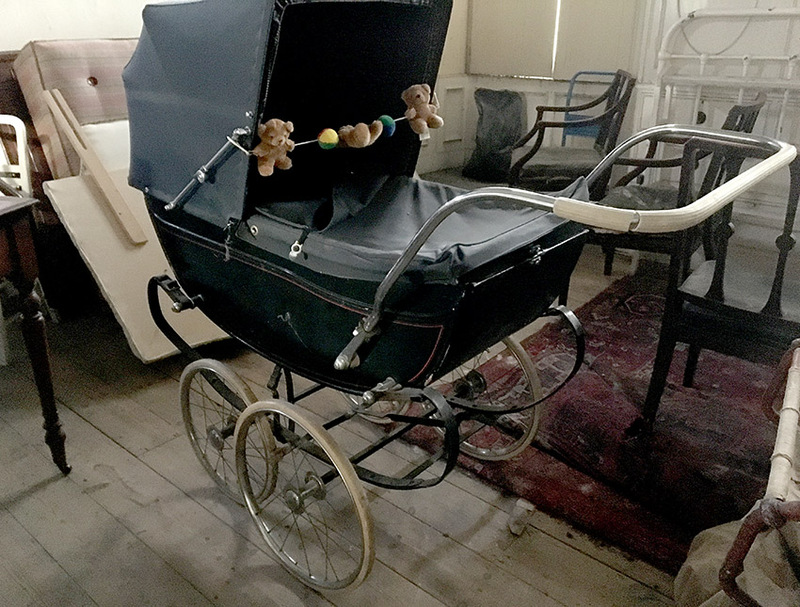 Thank you – it is actually my old pram although it has lots of later sisters in it!! Why will it not allow me to subscribe? Says invalid email address. I laughed so hard!. I always enjoy your writings so much and this particular one did not disappoint! I remember having a doll carriage (pram)like the one you have in the picture. Brought back memories. I love it! How exciting it would be…..thank you for sharing the antics. So enjoyed this! I grew up in a house in the Midwest that was haunted by a friendly spirit. 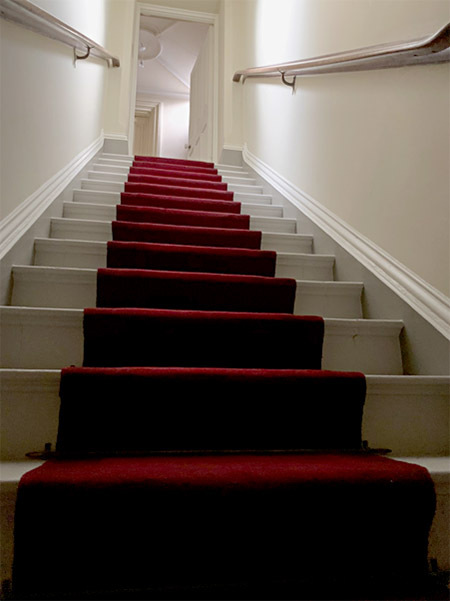 Now I work in an historic home that has at least four ghosts we can identify – all friendly except for one that occasionally trods up an empty staircase and produces chills in everyone who hears it. Oh, Lady Carnarvon, you can make us laugh or make us cry with sentiment. This blog was so well written again and so so funny plus full of suspense! But if I’d been up there and felt that tape measure touch my hair, I would still be screaming. Did you hear Hannah screaming from below? I’m surprised she needed to demonstrate it later on. What fun! Did the pups freak out at their behavior and screaming? I don’t think I’d stay up there with any of those men knowing in any opportunity, they’d become pranksters. Loved your pram. Our baby strollers pale in comparison. Our museum displayed a small pram in the Downton Abbey Exhibit here in FL. God bless you and your staff! What an exciting blog ! I got chills and laughed at the same time ! What fabulous history the house holds. And the pram is amazing !! I would not go into those creepy rooms for all the tea in China! I am an absolute wimp and your team would have to carry me out on a stretcher – haha! Still, I’m so curious, and it pains me that we will never know all the stories (scary or not) of the emptied rooms in your and many other castles. Love your Blog – all the way from South Africa. Thank you for posting this with so many pictures! When touring historic houses, I always want to get lost in the nooks and crannies the public aren’t generally allowed. Even as a little girl of only 7 years old, when my father would take me to see FDR’s home, Springhurst, and the Vanderbilt estate down the road, in Hyde Park, NY. I remember endlessly questioning the guides as to why we couldn’t go to certain floors, what was up there, were there pictures, etc. I’m sure they thought me a complete and utter pest. Seeing these pics of off limits spaces is such a treat. Thank you, again, it’s wonderful to see them! Beautiful old pram, too! Absolutely brilliant! I would have screamed the place down, then got embarrassed and would be giggling constantly at the thought of it! Such a great post! Thank you! I am not sure Hannah is that worried … she was also the one stuck in my office window setting all the alarms off!!! What a hilarious read!!! I think a “Haunted Highclere” Halloween event would be terrific fun…it sounds like Josh already has lots of spooky ideas up his sleeves! Your prosaic notes are like blasts of fresh air and kindness. Lenox, Massachusetts and Langport, Somerset fans. Oh, what a wonderful and amusing “ghost”-story with good sense of humor. Very british, I enjoyed it so much. The pram is gorgeous. Would love to visit the castle. Happy new year! What an entertaining read!!! I think a Halloween “Haunted Highclere” event would be terrific fun…it sounds like Josh already has lots of spooky ideas up his sleeves! This is a sweet and funny story! I am laughing so much. But, I do believe. ..
Oh, how it must be amusing be to have a on your staff persons who are easily spooked and those who like to spook them!!! Too funny!!! That was the funniest I’ve read in so long, kept me in stitches. Thank you for your hilarity, it made my day. You are such a good writer. Wonderful blog Lady Carnarvon! So funny and suspenseful at the same time. 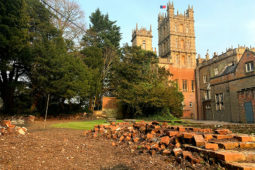 I’m so jealous of the staffs adventures exploring the depths of Highclere. Was so fortunate to fulfill a bucket list item and visited Highclere this past June and would give anything to explore some scary castle rooms! What a hilarious tale! I imagined the music from Halloween as Hannah screamed and your puppies happily exploring the castle, tails wagging. I also wondered if Hannah saw a scary doll in that beautiful pram. It was Stella and Freya – Scooby doo (the puppies uncle) was not going to go up.. Since you’ve been living in the castle, have you had any other ghostly experiences? 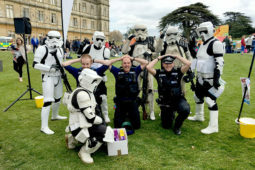 I have – they are in my next book …look behind you!!! Dear Lady of a wonderful castle,your text and photos were able to transport your readers to corridors and long forgotten dusty and misterious places of your full of history home…Thank you for the opportunity to visit that part of the castle,along with your brave crew! Dogs are faithful companions,but can also be easily frightened (especially if their owners are afraid of everything,too! ).Hope to know more details about your next book soon! Courage to all your assistants! Any plans for some more behind the scenes stories from the upper floors? Oh, what a way to start my day! I could just picture the mayhem and escalating terror the the faces of those poking around the attic of the Castle. I am sure they beat a hasty retreat once they found what they we searching for. Great fun! As much as I love it there, I would have waited at the bottom shouting up at every scream, “What happened?” I expect I would be frozen to the spot offering no assistance to the brave explorers. I mean, after all, someone must alert the police and report on the names of the lost adventurers. A delightful read – I felt like I was there trying to help! I TRULY READING YOUR BLOG AND THE COMMENTS. YOU ARE A BRETH OF FRESH AIR AND KEEP YOUR READERS IN TOUCH WITH THE REAL DOWNTON ABBEY. I would SO love to traverse the upper floors! I don’t scare easily, so I’d go alone. No worries. Thank you for sharing your home. I am new to your site, but not new to your home; having loved Downton Abby over the years. I look forward to reading what you have to share. One day I will make a visit, next time I’m in England. So glad I found your site. I plan to visit when I visit England again if possible. I look forward to reading about the real Downton Abby. Enjoyed this thoroughly! I have often wondered what was on the top floor. The photos were fascinating. It reminded me a bit of the film “The Secret Garden,” when Mary goes poking about the unused rooms. It was very funny – Hannah has not lived it down!! !